Saturday 22nd May: 2nd round of the swedish championship. We are also available at: Facebook, Twitter and YouTube. I have uploaded all the Swedish 950Kg Unlimited mini pulls from this year! http://picasaweb.google.com/Nasty.Toy/950KgUnlimited2009?feat=directlink not the best quality though, but better than nothing! Hi Pulling Fans, another shot from Italy. The italian 3,5 modified champion wish to thanks the people who help us. Hi Pulling fans, from Italy a rehauled website from Albertazzi Racing team, pulling in the pro-stock class. 2nd Part of Truck&TractorPulling on dutch RTL7. Here we have the next Team Biography and it's one of the most successful of all time, the Black Power Team. The team was founded in 1994 by the Jensen family in Denmark. Since then they have won 12xEuropean Championships, 29xDanish Championships, 5xNordic Championships and 1x the Eurocup, but their biggest victory was the Winning the European Championships in Herning 2000 on homeground. Their first tractor was build in 1994 and in the winter 2009/2009 they build a totaly new tractor. They drive 2,5t &3,5t mod with the tractor. The tractor has 3-5x chevy 550cui fitted with Blowers, Enderle B&U-2 injections and MSD 44 ignitions. They have a homemade transmission and a Rockwell differential. The tractor is very light but still very strong and makes always a very greeir favoritat show with fast runs on the rear wheels. The pulls are in Hjallerup and Füchtorf. Their goals for the next saison are clear winning Danish Championships and reach a top 3 place at the European Championships and in the EuroCup. To reach these goals the team is making some secret changes. Thanks to Google, who have enlarged my picasa webspace to 80 GB, I can now share several (old and not so old) US videos I have sitting on the shelf. Gives me a good reason to finally convert and store them on HDD and upload them to my picasa gallery. I am converting and uploading (and will keep on doing so for a while) as I type. Check by and also check that gallery in the future! 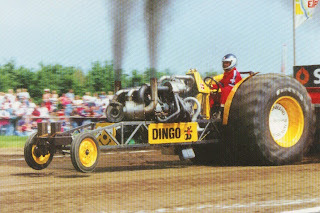 I've send some Emails to some teams with some questions to make some Biographys of the teams, the first one is the Dingo Team with their tractor Dingo. The team was found in 1987 by the four Larsen Brothers in Denmark. The first Dingo was built during winter 86/87 with a Volvo TD50 Engine. In the next years the took bigger and bigger engines. Finaly in 1993 they had a MAN v10 with 16l of displacement and 4 Turbos, you can see the tractor on the picture below, but the engine made some problems. Big Stage for the smallest! For those who can't wait until Zwolle to watch Indoor-Pulling the 21st of November (saturday) should be noted in your calendar. The first EUROPEAN FINAL PULL in Micropulling will take place in Anholt-Gendringen. 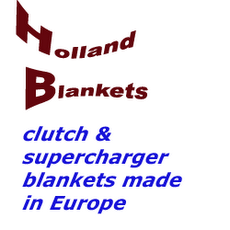 The Location is just a few steps from the former Tractorpulling-Arena on the dutch side of the boarder. Radio Controlled tractors from three nations will appear on the starting line. The host of the event is the agricultural contractor Van Haal. Every Top Tractor from the NMPO (Nederlandse Micropulling Organisation) and the German Community RCTP (Radio Controlled Tractorpulling) will fight under floodlight for the most important title in this motorsport. There are 6 categories (3,5kg; 4,5kg and 5,5kg modified; Two Wheel Drive such as 3,5kg and 4,5kg Superstocks). The spectators can watch the competition, sitting on the installed grandstands and follow the live results on a big wall screen. For the micropulling newbies the organization committee has created an information brochure. But als apart from the 13 meter track there's a lot to look at. The NTTO Super Stock tractor Zapo will join for exhibition such as the new 2,5t modified tractor Another Russian Invader with a transmash tank motor on methanol. For the physical well being there will be a diner and, most important, enough to drink. Stephan (Schizo) Görtz will care for the music. He already did this job on several DTTO Tractorpulling events. Together with the announcers he will create the typical Indoor-Pulling-Atmosphere. It will become especially noisy when the three tractors of the Team X-treme will appear in front of the sledge. The guys from Anholt and surrounding have good chances to win a trophee in their categories. One of the highlights of this Saturday evening will be the maiden run of Frema's Toy. Driver Martin Stouten was already well known for his turbine powered micropullers in the past. His latest creation is powered by two selfmade turbines, with a wheelspeed of at least 120 km/h and more than 10 hp. The Micropulling Comunity likes to welcome all pulling fans to watch this extraordinary kind of tractorpulling. The event will start at 4 o clock pm and THE ENTRANCE IS FREE !!! Some Videos from the US I found on the shelf (TV recordings from 2008). Google has expanded the paid webspace to 80gig. So need to fill it up some! For the Agritechnika Lemken did a special Videoclip with the Team Sonsbeck. Who said you can't farm with a Puller??? The NTTO A-Divison is back on TV! 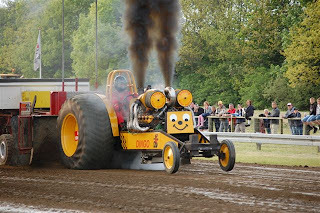 Check http://www.rtl.nl/components/sport/overig/miMedia/210281/210282.public.25151701.Truck_Tractor_Pulling_s5_a1.xml for the first show! Take a look at what goes on at the Just Smoky farm in harvest.. The 2010 rulebook for the DTTO Farm Puller (Farmer, Stock, (Super)Sport/Farm Stock) is out! Those who want to pull in those classes in Germany in 2010 should have a look to prevent "surprises" at the day of the event.